Come out and see what else we have in our Re-Use center. Maybe we have something that you can use! We also accept items. Maybe someone else can use it. Thank you for your continued support in the recycling program in Jay County. 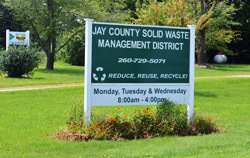 The Jay County Solid Waste Management District office can be reached at 260-729-5071 or jcswmd©gmail.com. Our normal business hours are Monday- Wednesday from 8:00 a.m. until 4:00 p.m.